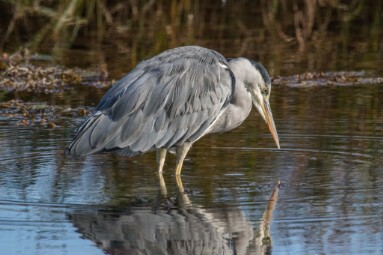 Gaunt Grey Herons are among the most familiar of our local water birds. Fresh or salt, clear or muddy each is acceptable so long as it will yield something worth eating. Sometimes when hunting the Grey Heron will stand very still watching and waiting. At other times the bird stalks through the shallows with long deliberate strides, neck muscles tensed. Eventually a fish will pay the price of carelessness as the heron's kinked neck is straightened with startling speed and the sharp bill stabs its prey. 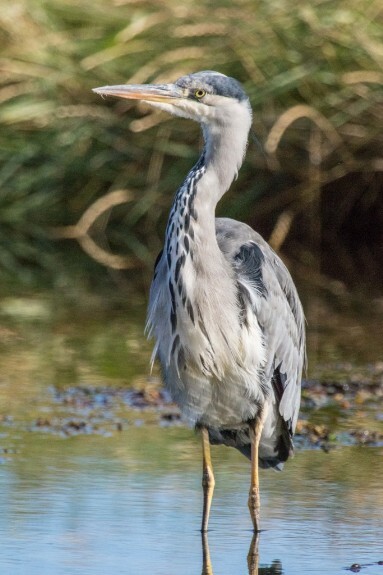 Not only fish, the Grey Heron takes a wide variety of food including frogs, mice, rats and young water birds up to and including the size of Moorhen. The birds breed colonially in spring in "heronries", usually building their nests high in trees The heron's breeding season is prolonged. In early February in a mild season, they may be seen soaring over the nesting wood and chasing one another, tilting from side to side and diving head-long. An exciting performance to watch. Endless display takes place on old nest platforms and consists of elaborate neck movements with crest and neck plumes erect and accompanied by bill-snapping and a variety of blood-curdling calls. For short periods the normally yellow-coloured bill and legs change dramatically to deep orange, especially when a group assembles on the 'dancing grounds' running and skipping first in one direction and then another with open wings. Occupied herons' nests may be readily told by numerous droppings on the ground beneath them. The pellets are the indigestible portions of heron's food. Unless blown down by storms the same nest is used each spring. Old ones, massive platforms 3ft across, may also provide homes for nesting small birds. They are built in the highest trees and constructed by branches and sticks. 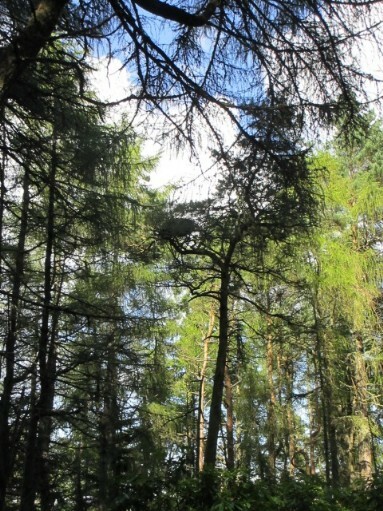 Local preferences include alder and Scots pine. Eggs can be laid from late February into March and April. Three or four is the average clutch. The eggs take about twenty five days to hatch. The young make a regular clicking sound and the young remain in the nest for about seven weeks being fed by both parents. Heronries are busy, noisy places throughout the long breeding period, enabling Grey Herons to be monitored efficiently and accurately by counting 'apparently occupied nests' in their heronries. 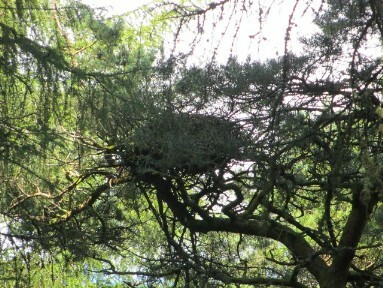 The British Trust for Ornithology’s Heronries Census has gathered nest counts annually since 1928 at an increasing proportion of the UK's heronries. The BTO aim to count as many heronries as possible each year and to ensure that newly established sites are quickly discovered and brought into the programme of annual counts. On Arran at present four heronries are monitored. These are in Lochranza, Brodick, Lamlash and Lagg but there may be more. Please keep your eyes and ears open. If you find a colony of nesting Grey Herons and suspect it may not be known to the Heronries Census, please report it to me in the first instance and I will inform the BTO. Hopefully if you do find a “new” heronry you would be prepared to monitor it and help to increase our knowledge of this familiar bird.